The South Australian Health and Medical Research Institute (SAHMRI) translates research into health solutions for the community. SAHMRI is an integrated facility in the heart of Adelaide with research labs and a Wellbeing and Resilience Centre in the same building, right next to the Royal Adelaide Hospital. The independent institute focuses on Aboriginal health, women’s and children’s health and major diseases including cancer, heart disease, and brain diseases. SAHMRI was named as one of The Times’ Higher Education best research centers in 2018. SAHMRI’s biorepository stores 150,000+ biospecimens to support their translational research. The biorepository has a central cryogenics facility that stores samples in liquid nitrogen tanks for SAHMRI researchers and collaborators. There are also more than sixty -80ºC freezers spread throughout the various labs in SAHMRI. These freezers are managed by the groups themselves. SAHMRI needed a flexible, cost-effective biospecimen management software to keep track of the samples stored throughout their facility. “We heard about OpenSpecimen by talking to current OpenSpecimen users like the Victorian Cancer Biobank (VCB) in Melbourne,” said Matt Lyon, Senior Analyst at SAHMRI who was tasked with finding the right informatics platform to manage the biospecimens data. VCB caters to a large consortium of hospitals and researchers and has been using OpenSpecimen for many years. “We chose OpenSpecimen because we heard good feedback from other users. The open-source, browser-based technology fits well within our existing infrastructure. We also liked the fact that OpenSpecimen has an active community here in Australia, and Krishagni offers very good support to users,” said Matt. “It’s helped us to be flexible and to cater for the varying needs of the different groups in SAHMRI. Having samples managed in a single system makes life much simpler and removes the issues of managing samples via spreadsheets.” said Matt. “Working with SAHMRI has been a very interesting experience for us. They are very active in providing community feedback and funding new features. 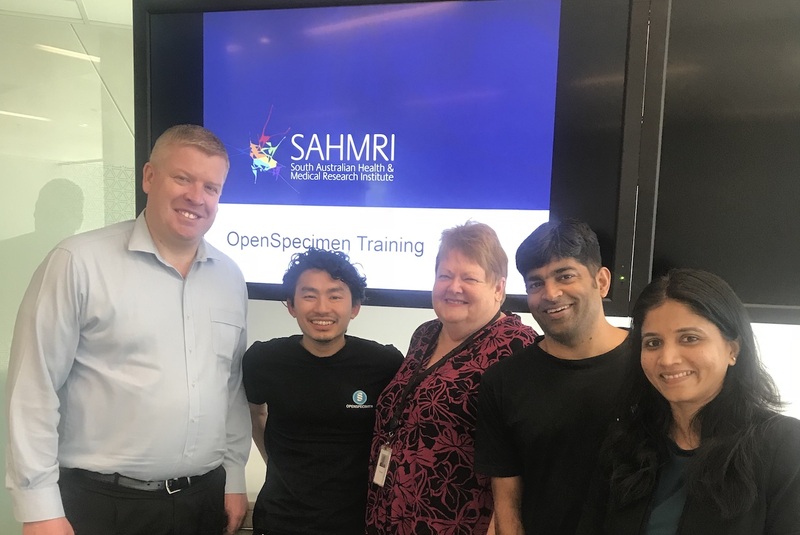 We also conducted an “OpenSpecimen Workshop” in Adelaide in 2018 which had biobankers from SAHMRI and others in Adelaide attend”, said Srikanth Adiga, CEO, OpenSpecimen.